Depth of field is defined as the distance in the object space within which the image of an object has an acceptable sharpness [1Kaschke M, Donnerhacke K-H, Rill MS. Optical devices in ophthalmology and optometry: Technology, design principles and clinical applications 1st ed. 1st ed.2014. [http://dx.doi.org/10.1002/9783527648962] ]. Many optical compensations and surgical procedures are focused on strategies for increasing depth of field and consequently improving vision at certain distances. Examples of these techniques are multifocal contact lenses, PresbyLASIK procedures, and the replacement of the lens by a Multifocal Intraocular Lens (MIOL) in cataract surgery or refractive lens exchange [2Charman WN. 2014. Developments in the correction of presbyopia I: Spectacle and contact lenses. Ophthal Physiol Opt [Internet] 2014 [cited 2014 Dec 3];34(1):8–29. Available:http://www.ncbi.nlm. nih.gov/pubmed/24205890-4Alio JL, Grzybowski A, El Aswad A, Romaniuk D. Refractive lens exchange. Surv Ophthalmol 2014; 59(6): 579-98. [http://dx.doi.org/10.1016/j.survophthal.2014.04.004] [PMID: 25127 929] ]. The measure of the depth of field, defined as the range of vision above a particular value of visual acuity, [5Gupta N, Wolffsohn JSW, Naroo SA. Optimizing measurement of subjective amplitude of accommodation with defocus curves. J Cataract Refract Surg 2008 [cited 2014 Dec 3];34(8):1329–38. http://www.ncbi.nlm.nih.gov/pubmed/18655984] should not be confused with the measure of visual performance through the field. Whereas the first one requires only to bring in and out a target to find the blur limits, the second one requires to look for the threshold of vision at each particular distance and therefore it requires longer testing times. The most popular method in clinical practice for evaluating the visual performance through the field with a MIOL is the Visual Acuity Defocus Curve (VADC) [6Plaza-Puche AB, Alio JL. Analysis of defocus curves of different modern multifocal intraocular lenses. Eur J Ophthalmol 2016; 26(5): 412-7.http://www.ncbi.nlm.nih.gov/pubmed/27135091 [Internet]. [http://dx.doi.org/10.5301/ejo.5000780] [PMID: 27135091] ], which consists of testing Visual Acuity (VA) through different levels of spectacle lens defocus with a VA chart. Despite several charts are available in clinical practice for testing VA, the Early Treatment Diabetic Retinopathy Study (ETDRS) VA chart is considered the gold standard and it is used in clinical trials with MIOLs [7MacRae S, Holladay JT, Glasser A, et al. Special report: American academy of ophthalmology task force consensus statement for extended depth of focus intraocular lenses. Ophthalmology 2017; 124(1): 139-41.http://linkinghub.elsevier.com/retrieve/pii/S0161642016313367 [Internet]. [http://dx.doi.org/10.1016/j.ophtha.2016.09.039] [PMID: 27743644] ]. However, ETDRS is usually conducted with static charts which require a long-time testing process, presenting the defocus lenses in a random order, or changing the chart during the process for avoiding memorization [8Wolffsohn JS, Jinabhai AN, Kingsnorth A, et al. Exploring the optimum step size for defocus curves. J Cataract Refract Surg 2013; 39(6): 873-80. [http://dx.doi.org/10.1016/j.jcrs.2013.01.031] [PMID: 23688874] , 9Gupta N, Naroo SA, Wolffsohn JS. 2007. Is randomisation necessary for measuring defocus curves in pre-presbyopes? Cont Lens Anterior Eye 2007 [cited 2014 Dec 3];30(2):119–24. http://www. ncbi.nlm.nih.gov/pubmed/17448927]. For these reasons, VADC is not widely included in clinical practice and it is recommended to use digitized charts with the randomized presentation of test letters for not requiring defocus lens randomization [7MacRae S, Holladay JT, Glasser A, et al. Special report: American academy of ophthalmology task force consensus statement for extended depth of focus intraocular lenses. Ophthalmology 2017; 124(1): 139-41.http://linkinghub.elsevier.com/retrieve/pii/S0161642016313367 [Internet]. [http://dx.doi.org/10.1016/j.ophtha.2016.09.039] [PMID: 27743644] ]. VADC has also the limitation of not being very sensitive to little changes in optical quality [10Rodríguez-Vallejo M, Remón L, Monsoriu JA, Furlan WD. Designing a new test for contrast sensitivity function measurement with iPad. J Optom 2015; 8(2): 101-8. [http://dx.doi.org/10.1016/j.optom.2014.06.003] [PMID: 25890826] ]. For this reason, low contrast VA tests [11Li J-H, Feng Y-F, Zhao Y-E, Zhao Y-Y, Lin L. Contrast visual acuity after multifocal intraocular lens implantation: Aspheric versus spherical design. Int J Ophthalmol 2014; 7(1): 100-3.http://www. pubmedcentral.nih.gov/articlerender.fcgi?artid=3949467 &tool=pmcentrez&rendertype=abstract[PMID: 24634872] ], Contrast Sensitivity (CS) tests based on letters [12Rocha KM, Chalita MR, Souza CEB, et al. Postoperative wavefront analysis and contrast sensitivity of a multifocal apodized diffractive IOL (ReSTOR) and three monofocal IOLs. J Refract Surg 2005; 21(6): S808-12.http://www.ncbi.nlm.nih.gov/pubmed/16329385[PMID: 16329385] ], and sinusoidal gratings [13Mojzis P, Peña-García P, Liehneova I, Ziak P, Alió JL. Outcomes of a new diffractive trifocal intraocular lens. 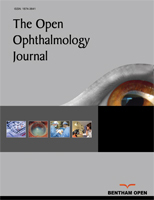 J Cataract Refract Surg 2014; 40(1): 60-9.https://linkinghub.elsevier.com/retrieve/pii/S0886335013011978[http://dx.doi.org/10.1016/j.jcrs.2013.06.025] [PMID: 24355721] ] have been commonly used for assessing visual performance with MIOLs. CS is less repeatable than VA [14Rodríguez-Vallejo M, Llorens-Quintana C, Furlan WD, Monsoriu JA. Visual acuity and contrast sensitivity screening with a new iPad application. Displays 2016; 44: 15-20.http://linkinghub.elsevier.com /retrieve/pii/S0141938216300956[http://dx.doi.org/10.1016/j.displa.2016.06.001] ] and therefore requires complex psychophysical methods to obtain reliable measures, taking between 2 to 5 minutes per defocus point for the fastest reported procedures [14Rodríguez-Vallejo M, Llorens-Quintana C, Furlan WD, Monsoriu JA. Visual acuity and contrast sensitivity screening with a new iPad application. Displays 2016; 44: 15-20.http://linkinghub.elsevier.com /retrieve/pii/S0141938216300956[http://dx.doi.org/10.1016/j.displa.2016.06.001] , 15Dorr M, Lesmes LA, Lu ZL, Bex PJ. Rapid and reliable assessment of the contrast sensitivity function on an iPad Inves Opthal Vis Sci 2013 [cited 2014 Jan 27];54(12):7266–73. Available from: http://www.ncbi.nlm.nih.gov/pubmed/24114545[http://dx.doi.org/10.1167/iovs.13-11743] ]. This means that for testing a CSDC with 11 defocus points, time spent would be around 22 and 55 minutes per eye. The main aim of this study was to introduce a new iPad app designed for the fast measure of VADC and CSDC. The first aim was to evaluate the agreement between the optotype used, crowded Snellen E versus the ETDRS for VA, and crowded Snellen E versus sinusoidal gratings from the ClinicCSF [10Rodríguez-Vallejo M, Remón L, Monsoriu JA, Furlan WD. Designing a new test for contrast sensitivity function measurement with iPad. J Optom 2015; 8(2): 101-8. [http://dx.doi.org/10.1016/j.optom.2014.06.003] [PMID: 25890826] ] test for measuring CSF. Then, the repeatability of the new app was evaluated for a range from +1.00 to -4.00 D of defocus lenses in -0.50 D steps. The defocus curve app (version 1.0.8) was developed by pure mobile ActionScript 3.0 code and compiled for IOS with Adobe Flash Builder (Adobe Systems, Inc.) for being reproduced in an iPad with at least 264 points per inch as the used in this study (model A1458, Apple Inc., Cupertino, CA, USA). The screen background brightness was set to 85%, ~250 cd/m2. The app was designed to measure VADC and CSDC using a Snellen E crowded optotype that changed its size or contrast depending on the selected procedure. We used the Snellen E because this has been employed for theoretically describing the relationship between spatial frequency with gratings and the VA [16Holladay JT, Van Dijk H, Lang A, et al. Optical performance of multifocal intraocular lenses. J Cataract Refract Surg 1990; 16(4): 413-22. [http://dx.doi.org/10.1016/S0886-3350(13)80793-6] [PMID: 2380922] ]. For VADC, a high contrast optotype (100%) changed its size along the range from 1.0 to -0.2 logMAR in 0.1 logMAR steps, whereas for CSDC, a fixed size optotype, equivalent to 0.3 logMAR size, changed its contrast along the range from 0 to 1.9 logarithmic units of CS (logCS) in 0.1 logCS steps (Fig. 1A ). The bitStealing method was used for expanding the capabilities of the display to represent contrasts [17Leek MR. Adaptive procedures in psychophysical research. Percept Psychophys 2001; 63(8): 1279-92.http://www.ncbi.nlm.nih.gov /pubmed/11800457[http://dx.doi.org/10.3758/BF03194543] [PMID: 11800457] ], and the gamma correction obtained from the mean of different displays was used for implementing this method [18Rodríguez-Vallejo M, Monsoriu JA, Furlan WD. Inter-display reproducibility of contrast sensitivity measurement with iPad. Optom Vis Sci 2016; 93(12): 1532-6. [http://dx.doi.org/10.1097/OPX.0000000000000972] [PMID: 27560 848] ]. The measurement procedure, either for VADC or CSDC, started with an alert message that indicated the defocus lens that should be inserted (starting in +1.00 D). The experimenter explained to the subject to respond one of the four possible orientations of the Snellen E in such a way that the experimenter only had to press the button corresponding to the answer given by the subject. The orientation of the Snellen E after each answer was presented randomly. The size (VADC) or contrast (CSDC) changed according to a simple up-down staircase psychophysical method which ended after three reversals [17Leek MR. Adaptive procedures in psychophysical research. Percept Psychophys 2001; 63(8): 1279-92.http://www.ncbi.nlm.nih.gov /pubmed/11800457[http://dx.doi.org/10.3758/BF03194543] [PMID: 11800457] ], obtaining the threshold with the average of these three reversals [10Rodríguez-Vallejo M, Remón L, Monsoriu JA, Furlan WD. Designing a new test for contrast sensitivity function measurement with iPad. J Optom 2015; 8(2): 101-8. [http://dx.doi.org/10.1016/j.optom.2014.06.003] [PMID: 25890826] ]. After testing the threshold for the first defocus lens, a new alert appeared over the screen with the defocus lens which should replace the previous one (from +1.00 D to +0.50 D) and the three reversals were repeated but then starting at the VA or CS threshold obtained with the previous defocus lens. This procedure was repeated for all the defocus lenses from +1.00 D to -4.00 D, in -0.50 D steps. The total time spent by the procedure was automatically recorded by the app, detecting the time that the experimenter needed to change the defocus lens during the alert messages and the time that the patient needed to answer to the optotypes orientation. For visual acuity, the agreement at a far distance with the Snellen E was evaluated versus an ETDRS chart. The ETDRS chart (Fig. 1B ) was reproduced in the iPad at 85% of screen brightness which corresponded to 250 cd/m2, spectral centroid 542 nm (measured with a Spyder4Elite colorimeter) [19Ricci F, Cedrone C, Cerulli L. Standardized measurement of visual acuity. Ophthalmic Epidemiol 1998; 5(1): 41-53. [http://dx.doi.org/10.1076/opep.5.1.41.1499] [PMID: 9575537] ]. The procedure for obtaining the VA threshold with the ETDRS chart included the following steps [20Beck RW, Moke PS, Turpin AH, Ferris FL, SanGiovanni JP, Johnson C a, et al. A computerized method of visual acuity testing: adaptation of the early treatment of diabetic retinopathy study testing protocol Am J Ophthalmol 2003; 135(2): 194–205. Available from: http://www.ncbi.nlm.nih.gov/pubmed/12566024]: 1) the subject read the first letter of the starting row and advanced one row with each right answer reading only one letter per row, 2) after the first mistake, the subject went to the previous row and read it completely, 3) advancing to the next row if the subject read 3/5 letters or went back to the previous if read less than 3/5; 4) the threshold was the last line for which the subject read 3/5 letters. Descriptive images for the tests used in the experiments. A) ETDRS chart; B) Contrast Sensitivity test for 3, 6, 12 and 18 cpd and C) Test for measuring Visual Acuity Defocus Curves (VADC) and Contrast Sensitivity Defocus Curve (CSDC). For contrast sensitivity, the agreement at far distance with the Snellen E was evaluated versus a CSF test previously validated (ClinicCSF) [10Rodríguez-Vallejo M, Remón L, Monsoriu JA, Furlan WD. Designing a new test for contrast sensitivity function measurement with iPad. J Optom 2015; 8(2): 101-8. [http://dx.doi.org/10.1016/j.optom.2014.06.003] [PMID: 25890826] , 14Rodríguez-Vallejo M, Llorens-Quintana C, Furlan WD, Monsoriu JA. Visual acuity and contrast sensitivity screening with a new iPad application. Displays 2016; 44: 15-20.http://linkinghub.elsevier.com /retrieve/pii/S0141938216300956[http://dx.doi.org/10.1016/j.displa.2016.06.001] ], consisting of four sinusoidal gratings (3, 6, 12 and 18 cycles per degree, cpd) over a mean achromatic background brightness of 85 cd/m2 (Fig. 1C ). Nine patches of different contrast levels were presented to the subject for each spatial frequency following a simple up-down staircase psychophysical method [17Leek MR. Adaptive procedures in psychophysical research. Percept Psychophys 2001; 63(8): 1279-92.http://www.ncbi.nlm.nih.gov /pubmed/11800457[http://dx.doi.org/10.3758/BF03194543] [PMID: 11800457] ], starting in the fifth patch level for each spatial frequency. In this method, CS went one level up (e.g. from level 5 to 6) after each right answer until the observer failed. Then, CS went down until the observer get right again. The CS threshold was determined by averaging the sensitivities at the turnaround points (i.e. the CS at the levels where direction changed) in the adaptive track for a total of five reversals. Normal distribution for differences between tests in the agreement experiment was tested with the Kolmogorov-Smirnov test. The Wilcoxon test was used for testing median differences in paired comparisons (z) and the Spearman’s rho (ρ) for correlations because of the non-normally distributions. The repeatability was calculated with one-way Analysis of Variance (ANOVA) and the repeatability limit (R) was equal to , [21McAlinden C, Khadka J, Pesudovs K. Precision (repeatability and reproducibility) studies and sample-size calculation. J Cataract Refract Surg 2015; 41(12): 2598-604. [http://dx.doi.org/10.1016/j.jcrs.2015.06.029] [PMID: 26796439] ]. The non-parametric Passing–Bablok model of linear regression was used to assess the agreement, as the Bland and Altman method cannot be used with non-parametric data samples [22Patton N, Aslam T, Murray G. Statistical strategies to assess reliability in ophthalmology. Eye (Lond) 2006; 20(7): 749-54.http://www. ncbi.nlm.nih.gov/pubmed/16327799 [Internet]. [http://dx.doi.org/10.1038/sj.eye.6702097] [PMID: 16327799] ]. The statistical analyses were performed using the IBM SPSS 20.0 software for Windows (SPSS, Chicago, IL) and MedCalc Software 15.2 (MedCalc, Ostende, Belgium). Agreement A. Visual acuity at far with the new app (VADC at 0D) versus the ETDRS chart; Agreement B. Contrast sensitivity from the new app (CSDC at 0D) and the contrast sensitivity function for frequencies of 3,6,12 and 18 cycles per degree. Repeatability results for visual acuity and contrast sensitivity defocus curves. Defocus curve is the most useful method for evaluating the subjective range of clear vision achieved with multifocal procedures. However, one of the most important drawbacks is that it is very time-consuming, which limits its use in clinical practice. Furthermore, some considerations during the measure, such as presenting random letters [7MacRae S, Holladay JT, Glasser A, et al. Special report: American academy of ophthalmology task force consensus statement for extended depth of focus intraocular lenses. Ophthalmology 2017; 124(1): 139-41.http://linkinghub.elsevier.com/retrieve/pii/S0161642016313367 [Internet]. [http://dx.doi.org/10.1016/j.ophtha.2016.09.039] [PMID: 27743644] ] or the defocus lenses in a random sequence [9Gupta N, Naroo SA, Wolffsohn JS. 2007. Is randomisation necessary for measuring defocus curves in pre-presbyopes? Cont Lens Anterior Eye 2007 [cited 2014 Dec 3];30(2):119–24. http://www. ncbi.nlm.nih.gov/pubmed/17448927], should be taking into account, leading to a complex procedure for obtaining reliable results and which entails an increase of the procedure time. In this study, we introduced a test for measuring VADC and CSDC in clinical practice with an iPad. No significant differences were found between the ETDRS and the VADC at far distance (Table 1). A median difference up to one line of VA between both tests might be expected due to the repeatability of the ETDRS chart as it has been previously reported [14Rodríguez-Vallejo M, Llorens-Quintana C, Furlan WD, Monsoriu JA. Visual acuity and contrast sensitivity screening with a new iPad application. Displays 2016; 44: 15-20.http://linkinghub.elsevier.com /retrieve/pii/S0141938216300956[http://dx.doi.org/10.1016/j.displa.2016.06.001] ]. In fact, Kędzierska et al., [23Kędzierska E, Petelczyc K, Kakarenko K, Bieda M, Kowalczyk A, Byszewska A, et al. Standardized ETDRS charts for mobile devices. Photonics Lett Pol 2017; 9(3): 88-90. [http://dx.doi.org/10.4302/plp.v9i3.757] ] reported in the agreement evaluation of ETDRS printed versus mobile device charts that the 59% of cases achieved the same level of visual acuity and 96% had differences of one line or less. In comparison to Kędzierska et al., [23Kędzierska E, Petelczyc K, Kakarenko K, Bieda M, Kowalczyk A, Byszewska A, et al. Standardized ETDRS charts for mobile devices. Photonics Lett Pol 2017; 9(3): 88-90. [http://dx.doi.org/10.4302/plp.v9i3.757] ] study, our agreement can be considered good because we achieved 45.8% of eyes with the same value of VA and 96.6% obtaining differences of ≤ 0.1 logMAR and our experiment involved two different optotypes and psychophysical procedures whereas Kędzierska et al., [23Kędzierska E, Petelczyc K, Kakarenko K, Bieda M, Kowalczyk A, Byszewska A, et al. Standardized ETDRS charts for mobile devices. Photonics Lett Pol 2017; 9(3): 88-90. [http://dx.doi.org/10.4302/plp.v9i3.757] ] maintained the chart and they only modified the way of presentation. Therefore, our method can be considered as interchangeable at far distance with the visual acuity measured with an ETDRS standard chart but we highlight that future studies should confirm this agreement along all the defocus curve. A post-study sample size calculation was performed to confirm whether the sample of eyes included in the current study was of adequate size using the software G*Power version 3.1 [24Faul F, Erdfelder E, Buchner A, Lang AG. Statistical power analyses using G*Power 3.1: Tests for correlation and regression analyses. Behav Res Methods 2009; 41(4): 1149-60. [http://dx.doi.org/10.3758/BRM.41.4.1149] [PMID: 19897823] ]. We computed the number of paired measures needed to detect a true difference of 0.05 logMAR in population means (d) with type I error probability (α) given a standard deviation (s). Specifically, for a statistical power of 80%, considering d and s changes and α of 0.05, the sample size required was 24 eyes. CS has been considered a standard measure for assessing the performance with MIOLs as it is more sensitive to small changes in optical quality than VA [10Rodríguez-Vallejo M, Remón L, Monsoriu JA, Furlan WD. Designing a new test for contrast sensitivity function measurement with iPad. J Optom 2015; 8(2): 101-8. [http://dx.doi.org/10.1016/j.optom.2014.06.003] [PMID: 25890826] ]. However, clinical studies evaluating differences in CS between MIOLs with clinical CSF tests usually measure only the far distance and have reported no significant differences for all the spatial frequencies [25Marques EF, Ferreira TB. Comparison of visual outcomes of 2 diffractive trifocal intraocular lenses. J Cataract Refract Surg 2015; 41(2): 354-63. [http://dx.doi.org/10.1016/j.jcrs.2014.05.048] [PMID: 25661129] -28Bilbao-Calabuig R, González-López F, Amparo F, Alvarez G, Patel SR, Llovet-Osuna F. Comparison between mix-and-match implantation of bifocal intraocular lenses and bilateral implantation of trifocal intraocular lenses. J Refract Surg 2016; 32(10): 659-63. [http://dx.doi.org/10.3928/1081597X-20160630-01] [PMID: 27722 752] ]. These findings reveal that the usefulness of CSF clinical tests is at least questionable for detecting small differences in optical quality among MIOLs even though these differences can be shown in optical bench [29Gatinel D, Houbrechts Y. Comparison of bifocal and trifocal diffractive and refractive intraocular lenses using an optical bench. J Cataract Refract Surg 2013; 39(7): 1093-9. [http://dx.doi.org/10.1016/j.jcrs.2013.01.048] [PMID: 23692884] ]. Therefore, we propose the measurement of CSDC which is similar to the Through Focus Response (TFR) [16Holladay JT, Van Dijk H, Lang A, et al. Optical performance of multifocal intraocular lenses. J Cataract Refract Surg 1990; 16(4): 413-22. [http://dx.doi.org/10.1016/S0886-3350(13)80793-6] [PMID: 2380922] ] in optical bench in order to detect these small changes in optical quality along all the defocus range that may not be detected by VADC. It is well known that letters are not comparable to sinusoidal gratings because letters contain a broad range of spatial frequencies with a predominant frequency [30Alexander KR, McAnany JJ. Determinants of contrast sensitivity for the tumbling E and Landolt C. Optom Vis Sci 2010; 87(1): 28-36. [http://dx.doi.org/10.1097/OPX.0b013e3181c61117] [PMID: 1999 6815] ]. However, our interest was to find the spatial frequency which showed a better agreement with this letter size. Theoretically, a spatial frequency of 15 cpd has the best agreement with an optotype size of 0.3 logMAR [16Holladay JT, Van Dijk H, Lang A, et al. Optical performance of multifocal intraocular lenses. J Cataract Refract Surg 1990; 16(4): 413-22. [http://dx.doi.org/10.1016/S0886-3350(13)80793-6] [PMID: 2380922] ]. However, we found that eyes obtained a higher CS with a sinusoidal grating of 18 cpd than the achieved with the optotype size of 0.3 logMAR. An important limitation of this analysis was the difference of background luminance between tests, whereas the CSDC test had a background luminance of 250 cd/m2, the CSF test had a luminance of 85 cd/m2. In summary, our experiment showed that the theoretical spatial frequency of 18 cpd overestimates the CS obtained with a 0.3 logMAR optotype, being the theoretical approximation of 15 cpd to 0.3 logMAR not completely correct [16Holladay JT, Van Dijk H, Lang A, et al. Optical performance of multifocal intraocular lenses. J Cataract Refract Surg 1990; 16(4): 413-22. [http://dx.doi.org/10.1016/S0886-3350(13)80793-6] [PMID: 2380922] ]. Our results showed a good repeatability along all the VADC, with differences equal or less than one line of VA between the two consecutive measures in the 70% of eyes along all the defocus curve, except for the +1.00 D of positive defocus for which the procedure was less repeatable. Unfortunately, despite many research studies have been conducted around conventional defocus curves [5Gupta N, Wolffsohn JSW, Naroo SA. Optimizing measurement of subjective amplitude of accommodation with defocus curves. J Cataract Refract Surg 2008 [cited 2014 Dec 3];34(8):1329–38. http://www.ncbi.nlm.nih.gov/pubmed/18655984, 8Wolffsohn JS, Jinabhai AN, Kingsnorth A, et al. Exploring the optimum step size for defocus curves. J Cataract Refract Surg 2013; 39(6): 873-80. [http://dx.doi.org/10.1016/j.jcrs.2013.01.031] [PMID: 23688874] , 9Gupta N, Naroo SA, Wolffsohn JS. 2007. Is randomisation necessary for measuring defocus curves in pre-presbyopes? Cont Lens Anterior Eye 2007 [cited 2014 Dec 3];30(2):119–24. http://www. ncbi.nlm.nih.gov/pubmed/17448927, 31Pieh S, Kellner C, Hanselmayer G, et al. Comparison of visual acuities at different distances and defocus curves. J Cataract Refract Surg 2002; 28(11): 1964-7.http://linkinghub.elsevier.com/retrieve/pii/S088 6335002013172 [Internet]. [http://dx.doi.org/10.1016/S0886-3350(02)01317-2] [PMID: 12457 670] , 32Buckhurst PJ, Wolffsohn JS, Naroo SA, et al. Multifocal intraocular lens differentiation using defocus curves. Invest Ophthalmol Vis Sci 2012; 53(7): 3920-6. [http://dx.doi.org/10.1167/iovs.11-9234] [PMID: 22589435] ], this is the first one that measure the repeatability along all the defocus curve therefore we cannot compare our repeatability with the conventional measure. Future studies should include the repeatability along the conventional defocus curve because this information is required in order to know when differences can be attributed to a real measure or to a bias due to the procedure of measurement. Besides this limitation, the reported repeatability limit of the ETDRS at far distance in a previous study (R=0.17) [14Rodríguez-Vallejo M, Llorens-Quintana C, Furlan WD, Monsoriu JA. Visual acuity and contrast sensitivity screening with a new iPad application. Displays 2016; 44: 15-20.http://linkinghub.elsevier.com /retrieve/pii/S0141938216300956[http://dx.doi.org/10.1016/j.displa.2016.06.001] ] was very close to the obtained far distance with this new app (R=0.18). Despite our interest of not increasing the time of the trial maintaining the psychophysical staircase with the same reversals in the VADC for CSDC, we found a poor repeatability of the procedure around three times higher than that obtained along the VADC (Table 2). It was expected a poorer repeatability of the CSDC in comparison of VADC, because CS tests are generally less repeatable than VA tests [14Rodríguez-Vallejo M, Llorens-Quintana C, Furlan WD, Monsoriu JA. Visual acuity and contrast sensitivity screening with a new iPad application. Displays 2016; 44: 15-20.http://linkinghub.elsevier.com /retrieve/pii/S0141938216300956[http://dx.doi.org/10.1016/j.displa.2016.06.001] , 33Bühren J, Terzi E, Bach M, Wesemann W, Kohnen T. Measuring contrast sensitivity under different lighting conditions: Comparison of three tests. Optom Vis Sci 2006; 83(5): 290-8. [http://dx.doi.org/10.1097/01.opx.0000216100.93302.2d] [PMID: 16699441] ]. The median test-retest difference in the CS along the defocus curve was -0.1 logCS, which indicates that the CS was one line higher in the second trial in comparison to the first trial probably due to a learning effect (Table 2). If we compare this finding with the VADC, we see that in half the defocus curve the median difference was 0.1 logMAR, which also indicates a probably learning effect in the VADC, but less important than in the CSDC. The great advantage of incorporating iPad devices to the clinical practice is that there exists low differences in brightness and contrast properties between models with common displays [18Rodríguez-Vallejo M, Monsoriu JA, Furlan WD. Inter-display reproducibility of contrast sensitivity measurement with iPad. Optom Vis Sci 2016; 93(12): 1532-6. [http://dx.doi.org/10.1097/OPX.0000000000000972] [PMID: 27560 848] , 34Bodduluri L, Boon MY, Dain SJ. Evaluation of tablet computers for visual function assessment. Behav Res Methods 2017; 49(2): 548-58.http://link.springer.com/10.3758/s13428-016-0725-1 [Internet]. [http://dx.doi.org/10.3758/s13428-016-0725-1] [PMID: 27004485] ], and new tests can be programmed without requiring a previous calibration if the test has been designed considering the mean luminance properties of several devices [18Rodríguez-Vallejo M, Monsoriu JA, Furlan WD. Inter-display reproducibility of contrast sensitivity measurement with iPad. Optom Vis Sci 2016; 93(12): 1532-6. [http://dx.doi.org/10.1097/OPX.0000000000000972] [PMID: 27560 848] ]. In addition, new metrics can be derived in real time such as the area under the defocus curve, which so far was only possible with complex analysis difficult to implement for the clinician [32Buckhurst PJ, Wolffsohn JS, Naroo SA, et al. Multifocal intraocular lens differentiation using defocus curves. Invest Ophthalmol Vis Sci 2012; 53(7): 3920-6. [http://dx.doi.org/10.1167/iovs.11-9234] [PMID: 22589435] ]. This new metric can help to predict the visual performance before surgery based on biometric eye characteristics as we have recently demonstrated [35Fernández J, Rodríguez-Vallejo M, Martínez J, Tauste A, Piñero DP. Biometric factors associated with the visual performance of a high addition multifocal intraocular lens. Curr Eye Res 2018; 43(8): 998-1005.http://www.tandfonline.com/action/journalInformation?journalCode=icey20%0Ahttps://doi.org/10.1080/02713683.2018.1478981[http://dx.doi.org/10.1080/02713683.2018.1478981] [PMID: 29776 319] ]. Our VADC app accomplished the purpose for which was designed, the measure of the VADC in around 8 minutes without a considerable loss of repeatability. However, the repeatability of CSDC was significantly poorer in comparison to VADC and other CS tests [18Rodríguez-Vallejo M, Monsoriu JA, Furlan WD. Inter-display reproducibility of contrast sensitivity measurement with iPad. Optom Vis Sci 2016; 93(12): 1532-6. [http://dx.doi.org/10.1097/OPX.0000000000000972] [PMID: 27560 848] ]. There are another computerized CS tests with considerable higher repeatability than the obtained in this study such as the FrACT because of its advanced psychophysical method [36Kollbaum PS, Jansen ME, Kollbaum EJ, Bullimore MA. Validation of an iPad test of letter contrast sensitivity. Optom Vis Sci 2014; 91(3): 291-6. [PMID: 24413274] ], however measurement time with this tests is such as high that hardly can be considered in clinical practice for measuring defocus curves. In fact, Bach reported 1.7 minutes for measuring VA at far distance with test-retest repeatability of 0.2 logMAR [37Bach M. The Freiburg Visual Acuity Test-variability unchanged by post-hoc re-analysis Graefes Arch Clin Exp Ophthalmol 2007 [cited 2012 Aug 17];245(7):965–71. Available from: http://www.ncbi.nlm. nih.gov/pubmed/17219125[http://dx.doi.org/10.1007/s00417-006-0474-4] ]. This would be 18.7 minutes for 11 defocus levels with the same repeatability than the obtained in our study at far distance (R = 0.18 logMAR). Therefore, the higher time-consuming of the FrACT does not demonstrate higher repeatability than our test in VA. On the other hand, it is required to look for the optimal equilibrium between precision/time in CSDC with our App by means of increasing the number of staircase reversals (time of the trial) for improving the repeatability without increasing significantly the time required to complete the test [15Dorr M, Lesmes LA, Lu ZL, Bex PJ. Rapid and reliable assessment of the contrast sensitivity function on an iPad Inves Opthal Vis Sci 2013 [cited 2014 Jan 27];54(12):7266–73. Available from: http://www.ncbi.nlm.nih.gov/pubmed/24114545[http://dx.doi.org/10.1167/iovs.13-11743] , 38Dorr M, Lesmes LA, Elze T, Wang H, Lu ZL, Bex PJ. Evaluation of the precision of contrast sensitivity function assessment on a tablet device. Sci Rep 2017; 7: 46706.http://www.nature.com/articles /srep46706[http://dx.doi.org/10.1038/srep46706] [PMID: 28429773] , 39Dorr M, Elze T, Wang H, Lu Z-L, Bex PJ, Lesmes LA. New Precision Metrics for Contrast Sensitivity Testing IEEE J Biomed Heal informatics 2018; 22(3): 919–25. Available from: http://ieeexplore. ieee.org/document/7959048/[http://dx.doi.org/10.1109/JBHI.2017.2708745] ].